There is absolutely no earthly pain more acute than enduring the loss of your child. I am not downplaying the significance or grief of other losses, but in my estimation, nothing compares to losing one of your babies. Reading along and sharing these posts, and performing even the smallest kindness in Adam's memory, not only pleases the God that my brother loved and served, but it is an immeasurable kindness to my mother. Knowing that her son's life, while senselessly brief, continues to shine light in a dark world provides a comfort and healing that I haven't seen her experience until we started doing 31 Days of Kindness three years ago. #AdamsActs are reaching much further than you all could possibly know. I have received countless private messages from people who have been overwhelmed and inspired by you all, and have found healing, hope and fresh resolve as they face deep and excruciating losses. It is not my place to tell all their stories, but for Day 3, I will tell you one remarkable story of loss and new life. My friend Kristy is a warrior. She is the kind of warrior who endured life hardships long before she faced the worst trial of her life, the loss of her beautiful son, Conner. Today should be his 15th birthday. Kristy has spent the years since Conner went to heaven bringing awareness to the nightmare of childhood cancer, and all the precious kiddos that are forced to battle for their lives each year. She has used her voice to try to prevent other families from suffering the way she and her husband and daughter have suffered. Kristy dreamed (privately and out loud to anyone who would listen!) of having another child. For quite a while it did not seem like it was in the cards for Kristy and Nate, but God sort of stepped in and blew her mind. She finally had the pregnancy that she had been hoping for, and on top of that, found out that she was having another baby boy. When I woke up and saw that Kristy went into labor this morning, on Conner's birthday... deciding what to do for Day 3 was an absolute no-brainer. I put together a gift basket of completely unrelated items. 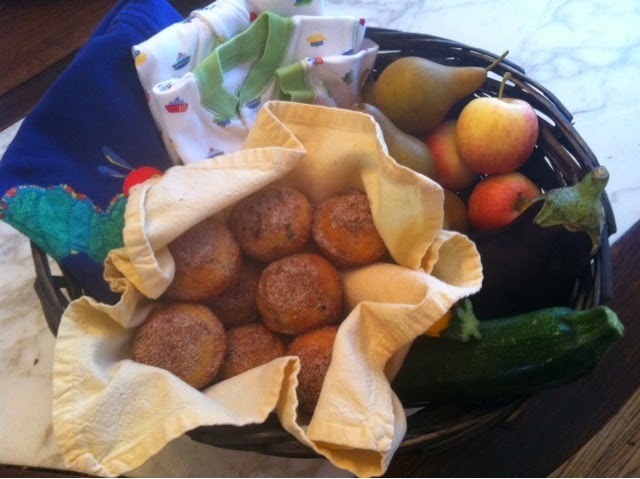 There were a couple little baby boy sleepers, some apples, pears, freshly-baked blueberry muffins, two squash and an eggplant. Not your typical "welcome to the world" baby gift... buuuuut... I don't really want to talk about that anymore. Believe it or not, the contents of said basket were not the weirdest part. 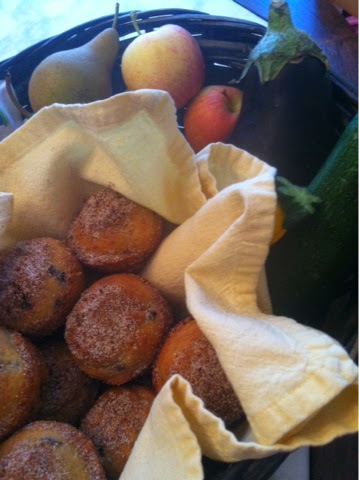 My lovely and kind-to-the-core friend, Shana, offered to deliver the basket for me as her act of kindness for the day. I knew Kristy was having a home birth and I thought "oh perfect, because it wasn't like I was gonna pop in mid-birth to say 'hi' anyways." Poor Shana. She pulls up to the house and people were outside on the porch! She didn't know any of them, and she didn't even know Kristy's name, so she just got out (holding the world's dumbest, most confusing gift basket) and just says "Is someone havin' a baby in there!?" I mean, who doesn't want to be presented with eggplant by a stranger on the porch while they are giving birth? So, I will consider this a win. Because Shana and I make dreams come true. I know people say stupid religious cliches all the time, but when I say that God orchestrated every detail of this timing, I absolutely believe that to be true. These two boys will most likely be born on the same exact day... and while no child could absolutely never replace Kristy's firstborn baby boy, it is remarkable to know that they will have this gift of new life on the same day that they have longed to celebrate life the most. The reason I believe this is more than a cliche? Because God is in the business of bringing life from death. He knows all about losing your only Son. He knows about redemption. So, for Day 3, I couldn't resist sharing this beautiful story. This whole month of kindness began because I didn't want to curl into my grief. Instead of curling in, I wanted to open up and out. And that kind of vulnerability and stretching reopened some wounds at first... but ultimately it leads to lasting healing. Sure, the scars are there, and sometimes they look jagged and raw and even a little ugly. But, if you really see them for what they are, they are God's handwriting, and the message He writes is that we survived, that we exist, that we can heal. This month means nothing if we don't have to stretch and open up and struggle through the pain in order to survive and exist and heal. And although we will never stop wanting back what we lost, we will have uncurled ourselves just enough to make room for new life, new gifts, new mercies. 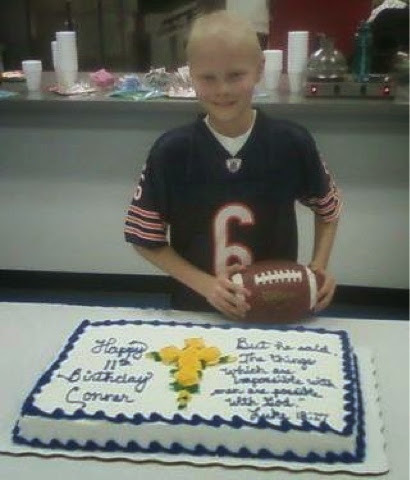 In loving memory of Conner, the big brother.